Don't get enough of the Obama family from their annual family photos and occasional inside-the-White House interviews? The next-best thing might be The First Family from Byron Allen's Entertainment Studio. 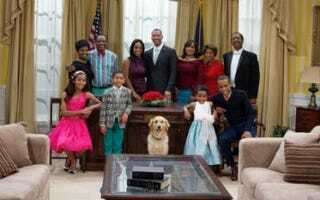 The sitcom, about an African-American family living in the White House, is set to air on NBC this fall. Entertainment Studios, Inc., (www.es.tv) the largest independent producer and distributor of first-run syndicated television programming for broadcast television stations, and owner of seven 24-hour HD television networks, announced that is has ordered 104 episodes of the new show. Production just wrapped on the pilot episode, which features an all-star cast including Christopher B. Duncan, Kellita Smith, Gladys Knight, Jackee Harry, John Witherspoon, Marla Gibbs, Michael D. Roberts, and Paul Rodriguez. Duncan (The Jamie Foxx Show, Veronica Mars) plays President William Johnson and Smith (The Bernie Mac Show) portrays the First Lady. R&B diva Knight plays the President's mother, Grandma Carolyn. Production is set to begin this summer for a Fall 2012 launch. Read more at the Times Leader.